Cuban culture is often portrayed as exotic and vibrant, filled with lively music and sun-kissed faces. If you were to walk into a screening of "Is That You?" (¿Eres tú, papá?) expecting a happy-go-lucky experience you'd be sorely mistaken. Cuba has finally become the setting of a psychological horror film thanks to Cuban-born, England-based filmmaker Rudy Riverón Sánchez. "Is That You?" is the first of its kind. It's a slow burning psychological thriller and despite not having an abundance of gory cheap thrills, it really makes its mark in the horror genre. While the lack of character backstories might bother a few, for me it heightens the mystery of the unknown. Rather than loads of red, flashy gore we are treated to dull muted browns, which effectively portrays slow-paced life in this particular corner of the country. Shot on-location in rural Cuban, the film is all the more authentic as one feels the dust and humidity from the sweltering Cuban sun. This environment seems ideal for the actors to easily sink into their subdued roles. A sense of unease and emotional struggle is perfectly depicted by the cast, particularly by relative newcomer Gabriela Ramos. The world within the film feels so real, with the silent moments and soft sounds adding to the believability of the tense nature of this dysfunctional family. Lili's domineering father Eduardo goes missing, which should mean a new beginning for her and her mother Alina but Lili misses him too much. She turns to a religious ritual to try to bring him back, which affects her family in unexpected ways. It's one of those films that really takes you by surprise with every tiny detail, whether it be the loud sounds of chewing, the rustling of leaves, the ominous music, or certain blank stares. Thrillers and horror genre films provoke the audience to react in a certain way, to jump at certain moments, and there were several occasions when I heard physical reactions nearby. In some ways Roman Polanski's 1965 film "Repulsion" starring Catherine Deneuve feels almost in the same vein as "Is That You? ", which is not a bad comparison. This is a quiet, tense and convincing film that makes you happy that your childhood was nothing like Lili's childhood. Her transformation throughout the film brings to mind Macaulay Culkin's performance in the 1993 film "The Good Son." The depth that Ramos reaches to properly convey Lili's mindset is powerful, especially considering that this is only her second film. Rudy Riverón Sánchez's feature debut doesn't mess around. 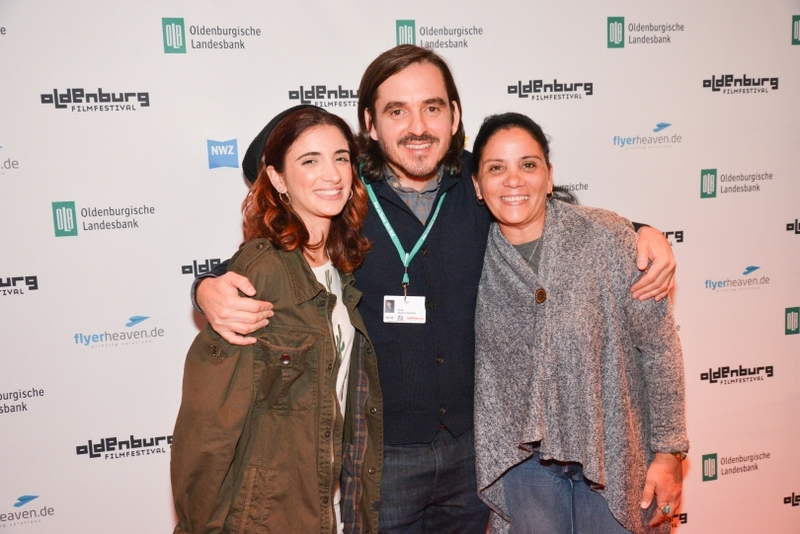 It had its world premiere at Oldenburg International Film Festival in mid-September, and afterwards I had the great pleasure to sit down with the director and his actors Gabriela Ramos and Jorge Enrique Caballero. It comes as no surprise that Ms. Ramos was awarded the Seymour Cassel Award for Outstanding Performance at the close of the festival. She is a force to be reckoned with and she and Riverón Sánchez surely have many amazing films awaiting them down the line. Luckily for me, Riverón Sánchez was able to help with any English-to-Spanish translation that Ms. Ramos needed during the interview. Congratulations on your world premiere last night. It was a bit of a surprise, a film that really crept up on you. There are so many feelings that came to mind while viewing it. During the screening we were all stunned into silence. Personally, I was a bit uncomfortable for much of the film. It was quite a cinematic experience, made all the more special knowing that you all were in the audience with us. The casting was spot-on, particularly Gabriela Ramos as Lili your 13-year old protagonist. Can you discuss how you cast her? Rudy Riverón Sánchez: Well, I have to say that I was very lucky. 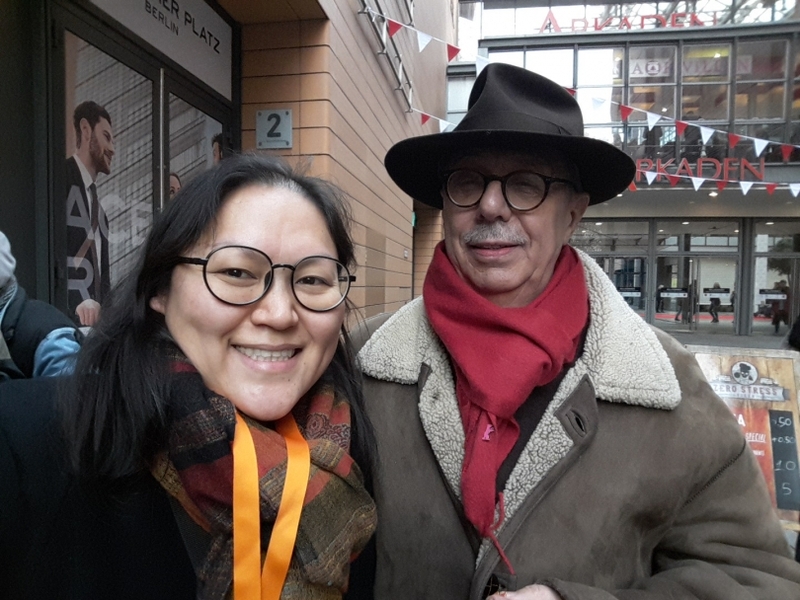 I had an opportunity to meet her and it was thanks to the cinematographer, Raúl Pérez Ureta, which is one of the oldest cinematographers in Cuba. I was doing casting and when he read the script he said, "Have a look and call this person Gabriela Ramos". He just finished working with her. She was working in a Fernando Pérez film as a secondary character. He said, "I saw that girl and maybe you can think about it". And then I called her and said come in to cast. I was doing casting with two other people and I couldn't find the Lili that I was looking for. And when I met Gabriela I thought maybe we can try because she gave me that look and certain energy, but I didn't want to have someone with the opposite energy. And then so of course to explore those moments, she got in the film. I wasn't sure at the very beginning if she could do it because she didn't have the experience, and the character demands a lot. So we did a rehearsal. The producer was like, "Rudy, are you sure?" So I did a rehearsal for a week. That's a true story. So for this week-long rehearsal, you were kind of testing the waters with Gabriela? RRS: Yeah, testing the waters. It was quite risky. The producer was very concerned because she said that we don't have that much time and it's taking a long time to cast. Start it right now. And then we started working and I wasn't sure after five days so I thought we can get there. But I liked her; I was 70% that she could be Lili, but I needed that extra 30%. And I thought how can I get it? And then when I asked the producer for an extra week to do rehearsals with Gabriela, she was even saying, "Rudy, can we please, please?" And then the second week by Thursday I knew that she was going to be able to perform Lili because I focused on certain scenes and had to see the development of Gabriela with the character. After two weeks I just say she's the one and then I said that to her and she reacted very happy. Her mother was going super happy. But I guess they didn't know what they were going to face later on during the work. I mean she worked incredibly hard and I never heard her complain. How can somebody so young and such little experience be such a strong character? When I was in England everybody told me if you get the wrong cast for the girl you're film will be over. Because the character leads the whole story. She is the main protagonist. She has to take control of many situations. If you just lose that, then the film is over. So how old was she when you were shooting the film? RRS: She was fifteen throughout the filming. And then she was playing the role of thirteen to fourteen. She was a very believable thirteen year old. Especially these days when so many films cast someone who looks ten years older than their character's age. RRS: No, no it was only a year, but of course to find and realize someone who is really thirteen is really hard because to develop those tools, to come with those emotions. And with puberty, you don't know that much about life. In the discovery of things. So everybody was really not panicking but they were really concerned. Rudy, you have a massive responsibility. One mistake, and it's over. That's a lot of pressure on your shoulders. RRS: Yeah, you have the pressure but what else can you do? You wanna make the film. But to make the film you need to do your best and of course the people around you are giving you advice and are always making a lot of questions that put me back into perspective. You know, she was there to put me into perspective, it's like challenging me. When I said to the casting director (Libia Batista) look, she knew her (Gabriela) already. She said, "Oh, that's great that you have advice from Raúl Pérez Ureta because she's great. You will love her." I mean everybody was talking really great about her because as a kid she was already flourishing. But I knew this film wasn't a comedy or a light story. It was dark, a dysfunctional family, a lot of elements around that involve emotionally, psychologically the interior of the character. So yeah, it was quite risky but if you don't take a risk then you don't sometime get the result. So I think Raúl Pérez Ureta played a big role in that, suggesting Gabriela Ramos. And I listen to him very well because he is a well-experienced filmmaker. He's been making films since the 60s. Yeah, I took a peak at his IMDB page and saw that he was credited with having worked on 62 projects. RRS: Yeah, he's just incredible. You learn by being yourself but you need your ears wide open to listen to other experienced people because it's not wise to think that you know about everything. And I don't want to know about everything. I just want to know step-by-step and build my career brick-by-brick. Sounds like you're on the right track. It was great hearing you all answer some questions after the premiere. It was interesting when you said that as a writer you almost feel like God, creating this new world through writing your words but then when you give these words to your actors, you are open and willing for them to take them and interpret as they see fit. Other writers and filmmakers sometimes come across as rigid and inflexible with regards to their text. RRS: Yeah, I guide them to achieve the style that I want because I know the style. In Cuba there is no actor that works with that style. That was another concern with everybody because you see in Cuban films they portray and express an emotion. The physicality of the characters are high energy, very expressive and this was contained. RRS: Yes, restrictive so it's like the opposite. I'm sorry please tell me the question again? I was interested in hearing more about your writing process. You stated that once you are done writing the script then you allow the actors to take your words and have freedom to interpret them, take them as their own. RRS: I'm saying from my modest experience because this is my first feature film that I write. When I start writing I felt like I was in control, like I was powerful. I was putting people in places as I wanted. Putting their names and situations, and I'm gonna put this and create this new world. For later on when you carry on writing, the characters start getting stronger, psychologically. It's on the paper, on the language of the script; it's not on the film, a script is just a paper with words and ideas. After a while, I lost totally the power that I used to have at the beginning, when I was with the first draft. When the characters started growing I lost the power that I had. They were asking me for a thing and I started working for them because they were asking me things in a way that I couldn't place. Because when you start putting things in place, if you see the character through their eyes you see the world of every character and it's not about me anymore. It's not about me as a writer, it's about Lili or Eduardo or Carlos. So yeah, it's like you become...How can I say this? You do everything for them. I wouldn't say a slave but...you obey them. For me, it's like now I need to obey whatever the characters need. I need to please them, I need to give them what they are asking for specific situations. It was a really interesting experience for me. I would like hear from Gabriela Ramos and Jorge Enrique Caballero who are sitting here with us. How was it working with Rudy as a first-time director? How is his directing style compared to other directors with whom you've worked? Gabriela Ramos: Because I only have one previous experience with Fernando Pérez, another Cuban director, he gave a certain amount of freedom. Something that came more from my personal life, more related to my experience as a Cuban person. The age of the character that I played in Fernando Pérez's film I could relate to because the character's age was closer to my own age, lifestyle, being Cubans, being teenagers. So I felt closer to the character. Let's hope that no teenagers feel that Lili is a relatable character for them. That's a pretty dark and twisted childhood to live through. GR: When I met Lili and I realized that personally the character had nothing to do with me, I felt like I had to let myself be guided by the director in order to understand Lili because it was somebody I did not have any relation to. It was like an alien for me. After it all, I felt well because we understood each other in order to get to Lili. At the beginning, I thought that things were going to be harder, a really difficult job to do and then it became easier because we got together and unified in order to collaborate in a way that we achieve Lili. The two week-long rehearsal and probationary period must have been a bit stressful and nerve-wracking. Can you describe how you felt when you learned that you got the role of Lili? GR: I felt very happy but at the same time very nervous because of the level of responsibility that I was going to take. And I knew, as an actor, that it was going to be a completely different experience but it was going to help me to see differently, to grow as an actor because of the challenges involved. Yeah, the way you portrayed Lili with all of her subtle looks and movements effectively creeped me out. It seemed like many people were on the edge of their seats. The music and the way the actors played off of one another really made this an intense viewing experience, even more so knowing the crew and cast were in the audience with us. And what about you, Jorge? How was your experience working with Rudy as a first-time director? Jorge Enrique Caballero: For me, in the beginning it was very difficult because I have a lot of experience in making film and television and theater too. When I wrote Rudy, and Rudy called me for the film he was starting to explain the mood, his style of performance. I am open to the ideas, for his proposal, to the collaboration. But inside me I wasn't feeling comfortable because it was new for me. But I respected his proposal and I listened all the time to Rudy. And I believe as actors you open your mind, you open and give all your arms to the director. You can do the good for the end of the film. I do that and I believe in Rudy. I read the story. The script for me was incredible. I loved the script and I loved my character (Carlos) too. In the rehearsals it was difficult in the beginning, I can say that. But Rudy is a director who has the film in his head, it's very clear with all the details in the film. And I said, "Wow, he knows his script, he knows his motives. It's clear." And when I see that in Rudy, I believe in Rudy the director. For example, Rudy has the clear idea for the film, for the point of view of the movie. I love that. And I believe that. I'm an actor, I'm not a director or a writer and I need to believe in my director because the director is my eyes and my way, my steps. This is the relationship right now and at the time of the recording of the film. It sounds like there was a great deal of mutual respect among the cast and crew. The working environment must have been more relaxed than the dark tone of the film. Like it's your baby who finally grew up. RSS: Yeah, it's my baby and it finally started running, went to college, university and start driving. Honestly, I had an amazing experience with them. I learned a lot from every single one of them. Each different personality, each approach and then you have the challenge. And it's beautiful to work with clever actors, who are hungry for something different. That's the thing, one of the things before I forget to say, they were so hungry to do something different that that motivated them to be...to put everything into the film. How fortunate that you were able to bring different actors on board who shared that longing, that hunger for something new and different. RSS: And they needed it as well because they are experienced. But it's all too common in Cuba, if you seen Cuban cinema with the same face again and again. And for me having Gabriela and given the opportunity to grow because she is amazing, maybe she doesn't know that. And Jorgito (Jorge) and Lynn Cruz and Osvaldo Doimeadiós, it's important to give to the Cuban cinema fresh faces as talented as the old faces. And I think that they did the right job. They really stepped up to the plate. Working with such dark and moody material it must have drained your actors and crew. Were there any specific ways you all would decompress and release tension? How would you relax and have fun, or was the production very somber throughout? RSS: No, no, no. No, well actually... Osvaldo Doimeadiós (Eduardo) is a comedian so he was making jokes all the time. When we were on the break or lunch time he was making everybody laugh. But he could switch off, control from making jokes during the break time and then he came back and switch off and do it. Sometimes we were really tired, the cast was really tired so the mood was just quiet, eating or drinking. And people were looking after them. We didn't have a big group that we had trying to look after them. And you (looking at Gabriela) got ill a couple of times. We had to run to the hospital with them and then we had to stop and the production team did an amazing job looking for solutions to carry on because we have to carry on because of the time, because of the money. Everything that it takes. Yeah, for her it was a lot and I understand that it was a lot. But of course she didn't want to give up time feeling ill. She said, "No, no, no, no, I want to carry on." And I said, "No, no, you can't carry on." So she never said no. So were those some of the later scenes when Lili's complexion was much paler? Was she really sick? RSS: There are a couple of scenes where she was really ill. Remember you had the flu? And she wanted to carry on, so I said yeah. And it helped, those moments the character was ill in a way helped to the character. It was hard. We can not say that it wasn't. How many days was the shoot? RSS: Thirty-seven. Six days per week. Sundays off. And it was another thing...I'm just gonna add it. With the start of the film, I just wanted some stuff to be done. Well, sometimes I have to say that she helped me a lot. Even when we were in the most difficult time, she helped me so much, Gabriela Ramos, because we were quite behind with some scenes. And of course the producers were kind of panicking if we were gonna be able to finish the shoot. And I have the confidence and when I spoke to the first assistant director, I asked, "Can we have two days only with Lili's scenes? Do you think we can do one to two overload days with only Gabriela?" Once we got those two days we did Gabriela's scenes and we came back in time. That was the only way to recover time and the scenes regarding to her character, that's why I say I owe her a lot and then I am very grateful to her. So we did sometimes one or two takes because it was so already good. I didn't have to go five or six takes because we knew she could do that, one or two takes...boom, boom, boom, boom. There was a day when she did fifteen scenes in one day. RSS: That was very intense. It was like boom, boom, boom, boom. The way she portrayed Lili was so disturbing, leaving a lasting impression. Jorge also left an impression although for different reasons. RSS: And I loved working with Jorgito. He's a great actor. He's touring in a musical in Germany now. JEC: Yeah, "Carmen la Cubana" is the name of the show. RSS: You can google it online. It's everywhere. He's already been touring for three months. Wow, that's a big deal touring in a musical for so long. Congrats. Now to get back to "Is That You? ", can you all please describe how you felt seeing the film on the big screen for the first time? I mean the images, sounds and music all gave me goosebumps. Having finally seen the finished film I'm curious to hear about your impressions. GR: When you are on set recording, you see more or less a part of the work, and I found it was hard to understand how the final product is going to be because as my experience as an actor, you don't know. And even more in this kind of film that has a specific journey in order to have an impact on people. I think the film needs to have that specific soundtrack to create that impact on the story. My impression of the music and sound, in general, was that it worked really well. The last scene with that specific music gives a more stronger impact. RSS: We were actually talking about it, the feeling. She couldn't even recognize herself. RSS: "I forgot," she told me previously, "I don't know how I got that. I don't know how I did it. I couldn't recognize myself, I didn't know that I could look or do things like that. " GR: In the moment when you are on set working everything for the character but you don't know how it looks like, you don't see yourself, you just do it. And what about you as the director? I talked briefly with one of the composers after the premiere, and he was very happy with their music's role in the film. What kind of direction did you give them? RSS: Well, I've got two sessions in terms of the music. I always knew that I didn't want to make a film packed with Cuban music. I wanted to use contemporary music. The music for the film, not the music to sell the Cuban culture. There was just the one Cuban song playing on the radio when Carlos was sleeping. RSS: That is the diegetic song. There is a diegetic song there that is supposed to play on the radio inside the story. For everything that is not diegetic, the original score, there is not romantic Cuban music. And I know the composers (Owain Kelly and James Williams). They are friends of mine for ten years. We spoke about this for so long. I knew they can do it, I trust them. When they read the script they liked it and then we started talking about ideas. For me, it was a new experience as well because I've got certain ideas about the music. And when I got the sampling of the first rough cut I start trying music. What I thought could work, it didn't work. And then what I told them, I want certain dark piano here and there, it made the film really soppy and cliche. It didn't work. But then I couldn't create the music. I had to make some sounds and I didn't know if they sound right. I have to create with my mouth certain sounds to explain certain things. And then we get there by trying, trying, trying. Then they sent me a lot of demos, tracks of what they thought could work and for me it didn't so I moved it to another part of the film. When I started to build up and explain it then they start to see what I want and they come out and say okay. So it was very collaborative. I realize that the previous thing that I had at the very beginning that works in other films doesn't in ours. I just discovered something...that it's such a unique atmosphere because it's in Cuba and it's tropical with hot weather and sunny, and even when we shot in the winter and we are trying to bring down the sun and cross-pollution, it's a bright Cuban film. I just always knew that the music was fully a big element to tell the story in the film. I said to them that. They said to me that I felt a lot of pressure because if the music would have gone wrong then it would have destroyed the film, or it would have been another film, something else. So getting to the point was really, really, really difficult. To find the right track for every single scene, me and the composers, we sat days and days going scene by scene, explaining...me explaining what was behind every character, why they did what they did, why they react as they react. Specifically, to every scene so they knew that I need this type of sound and music here so they could understand the reason why, dramatically. They needed to understand the story and then that's how they got it and they brought me more demos and more demos. And then we built up the whole soundtrack. And then with the sound designer (Ben Baird) who is very experienced, thirty years experience, he understood the film straight-away. When we had a couple meetings, he said to me, "What is it specifically that you want?" And I gave him a few bullet points and then he went away and worked for a week or ten days or something. And then when I saw it, it was a lot of things like atmosphere. Then I shared with him about the crickets, how we can clean that because I couldn't dub the whole film. We had to do some ADR at some point. But we have to work with what we have and he was impressed by the sound recordings in Cuba. Like, wow your recordist has done an amazing job. So we started sharing ideas and we got together to put the design. He works with so many, in terms of atmosphere, little effect here and there. He understood so much of the story that when I saw the first layer of sound design I was thinking wow, this is a massive work that he really saved us a lot of time. The sound designer understood everything quickly and he loved the film, he was in love with the story, with the final cut and everything. So he makes the work easier, even when the work wasn't easy he makes the work easier. And then we work for a few weeks in tweaking and designing and moving things around just to get layers and layers. One person that was really, really helpful was the producer, giving us feedback all of the time. Emma Berkofsky was giving us feedback, feedback, feedback. And we were creating layers and layers, growing and growing and moving because you cannot do everything in one go. And we did a couple of tests on a cinema and we realized things that need to improve in certain areas because it's a massive length in a film. So we need to improve from a scene, we have to come back and carry on and then one day we just had it all. When you work with people that understand the story it makes everything easier. So that's why I would like to work with them again. I mean the experience with them was incredible. And I think he brought on some ideas and some suggestions that I loved and I thought, "Wow, this is really good." For example, he suggests that when Lili and Alina are alone at the table, and Lili says, "He's here" at that moment he put only one sound of the chair when she moved forward. He said that we only need this here, and I was thinking, my god, this is what we need. RSS: So simple, you don't need anything else. Sometimes with less is more. I gave him the bullet point of creating tension, and silence is really powerful. And he really understands this. People forget or diminish the power of silence. Add one sound here or even the sound of the cricket he creates tension. And he creates the atmosphere outside the house with crickets and certain winds of the trees because you need to hear the trees. So things like that when you work with the people who understand the story and they give everything it makes your life easier as a director. So maybe Jorgito can say something about the sound. JEC: Well, I was in a previous conversation with the composer and I made a question to the composer. How do you feel when Rudy makes the proposal for you to make the music for a Cuban film, a Cuban story? How do you feel? Because for me it's very, very good because Rudy, with this movie you broke with the stereotype of the Cuban, of the Cuban film. Maybe it's not the intention of Rudy. I don't know, but it's a fact. And about the music, for me I like the music in the film because it's a compliment, it's very important because the style. For example, the music supports many moments in the film. And you can feel that that's a sensation of the fear of many sequences, the mystery, the secret dark moments not only the photography but for the film sounds. I love this film, I love her. In this moment I don't want to see the technical details. I have to compromise, a strong compromise with the film emotionally on a different level because of almost two years of that film. And when I see the movie in the cinema I start to cry, yeah because wow you got it man. It was your idea. I can feel it, I can see it. For the film, the music is the compliment for the artificial material for many moments, the script. The film is a great job for a composer and director and the sound designer. The work together is great for a film. I agree. It seemed like the audience was also really into it, too. RSS: I think with every step you have to collaborate very deep in every single step, from the development of the script like with Emma Berkofsky. You have to get really deep in order to be open and listen to other people. You can not just be egotistical and close yourself in one room and think this. I don't wanna be like that. I like to listen to people because the director from my part, I want to be open and very vigilant and at the same time do what is right for the film. To put into one side what is not good for the film. So if you have that very clear you can pick up all the contributions in every single stage of the film from everybody that you work with from development of the script, from making the shoot, working with actors then post production with the music, sound designer, even the cinematographer so you need to hear the suggestions and say okay. Like for example, on the script I wrote a certain ending. The cinematographer he suggests me another ending, so I said to him, "Your idea is really good and mine is really good. We are colliding with two good ideas." So I say, "Let's do something, let's shoot both." So we shoot both, so in the cutting room when we put things together we know what will work but it's good to have both because his idea was really good and mine as well. And both were working but we need to make a decision based on what was written in the script and in the cutting room we didn't use any of those. RSS: I used in the end something that was already written but wasn't going to be the end. So the ending that I used for the script I didn't use it and the idea that we thought was a great idea we never used it. We ended up with another ending, another option. So when you are prepared to be open you need to work for the film. One day, once the cast bring the characters alive and you have the colors, you have the set, the house, the people walking you start even sensing a smell and a situation so you can not think as a director "me, myself and I". There is no more director. It's about the product, it's about the story and you need to think what works and what doesn't work. And that's your responsibility as a director, not to be egotistical and think I've got this only and me and I'm frustrated. No, no, no, it's the story and how you work with the story. Yeah, that sounds like an ideal collaborative process. JEC: If I could just have a moment to share a story from the collaborative process. You remember in the sequence when shooting my character Carlos, you say to take the motorcycle and go? I said, "Rudy, my character learned to drive?" But he dreams to take the motorbike. In this moment, Rudy is open and says, "no, no, no, don't drive." And I rehearsed for one week to learn to ride the motorbike. But he has the desire to take Eduardo's motorbike. And this is the example of when you were open. RSS: It's about what really makes sense for the film. The thing is before, in a previous version of the script I show him doing certain things but when I went to Cuba I cut some stuff. I cut like six or seven pages from the script. And then I missed that point, and when he came back to me and say, "Hey Rudy, are you sure you want to have Carlos driving?" And I say, "You're right." RSS: Yeah, good call. That's collaboration. I don't believe in one brain, it's too many little details. And you need that, people who've got that willingness to get to the right place. That's how we make a good product, that's how we make a good film. And then of course you need to be vigilant because people come up sometimes with ideas that they are allowed to bring and don't work for the story. I see as one of the main responsibilities to the director is to know when something is good and is gonna improve the film and pick it up from anybody who can bring it. Because you are working with talented and intelligent people and you cannot alienate them. You just need to know when it's right or not for the film and you need to be open because you need to concentrate on making a good film. That's probably why your film works so well. 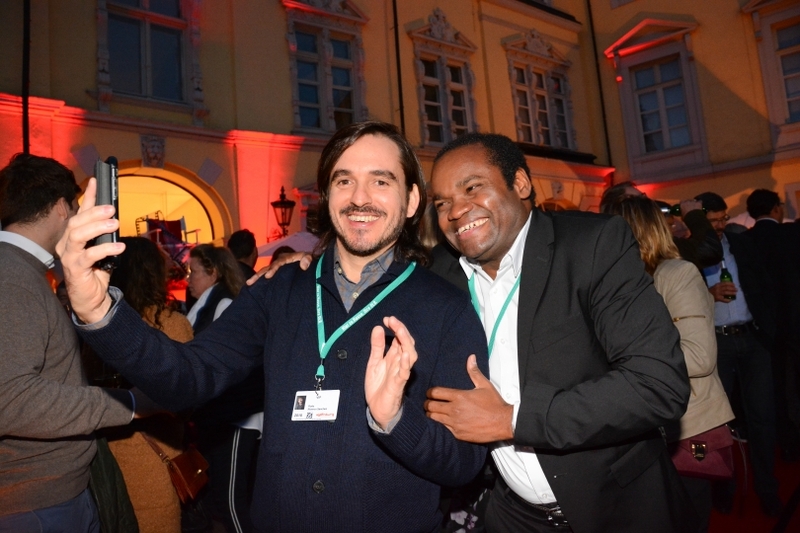 Thank you for bringing your film to Oldenburg. RSS: Thank you for having us here and letting us express our love for the film. What are the future plans for the film, regarding distribution and other film festivals? The film will have its Scandinavian Premiere at CPH PIX at the beginning of October and then the UK Premiere in Cambridge Film Festival at the end of the same month. We also have other festivals where the film will be shown but I'm afraid we're not allowed to share the details yet. In terms of distribution after the festivals, we're in discussion with distributors but it's too early to share any specifics. I'm looking forward to developing a psychological drama with the working title "Carlitos" after this period of festivals. Maybe to wind things down, I'd like you each to share three words that best describe your experience at the Oldenburg Film Festival? JEC: Friendly, easy and relaxed. RSS: You wanna go (to Gabriela)? RSS: For me it's a different perspective. I think it's feeling at home when someone opens the door for you and offers you everything. It's hospitality, feeling at home and it's like a family telling you to come here and have dinner with me and feeding you. It's like family, home and love. The way Lili was portrayed is very disturbing, leaving a lasting impression. Jorge also left an impression although for different reasons.